The current system, which was established some time ago and is clearly outdated, falls foul of a technical aspect requiring the Information Commissioners Office (ICO) to prove ‘substantial damage’. Sensible in many ways, except that companies can now make many more calls cheaper, foreign call centres have firmly established themselves in the day to day lives of UK consumers and technology has moved on making it easier for companies to make increased numbers of calls at minimal cost. Ministers have been in discussions for some time now on imposing much heavier fines at a much lower threshold of ‘proof’. Consumer groups naturally say the measures don’t and won’t go far enough. The ICO received approximately 120,000 complaints about “unsolicited marketing calls” from April-November 2013. It is illegal for companies to call UK numbers registered with either the TPS or CTPS. The rules do not apply, however, where people have consented to their details being used for marketing purposes. But the consumer organisation Which? says it has received many complaints about people being cold-called at home by many different companies, despite being signed up to the TPS. Many calls are made from overseas. Under Culture Secretary Maria Miller’s plans to lower the current “substantial damage” threshold which would have the intention of fining many companies more easily. The Ministry of Justice will launch a consultation in April 2014 on whether firms that break the rules should face fines of up to 20% of their annual turnover. 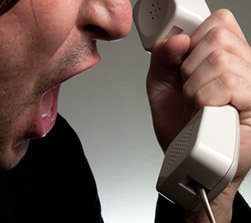 Under the new rules, claims management companies (CMCs) could also face punishment if they buy leads generated by other firms which bombard customers with unwanted cold calls or breach the TPS laws. CMCs advertise widely on TV, in newspapers and on the internet, encouraging people to sue for personal injury compensation and for other losses. Justice Secretary Chris Grayling said: “The Claims Management Regulator already takes tough action against companies which break the rules, suspending and closing down rogue firms, but now these fines will give us an extra weapon to drive bad behaviour out of the industry”. In April 2013, telecoms operator TalkTalk was fined £750,000 by regulator Ofcom for making an excessive number of abandoned and silent calls during a telemarketing campaign to attract new subscribers. TalkTalk said it had terminated its relationship with two call centres used when the problem was discovered. This is exactly the news the regulators want to hear with top down justice being enforced on smaller telemarketing companies failing to follow proper guidelines including the TPS regulations being enforced by the companies whom they represent.